People living next to the world’s largest desert lake, Turkana Lake, believe it is both a blessing and a curse. Thirty-five-year-old Lolaramaya of Kenya’s Turkana tribe says the shrinking Lake has pushed his community into a full-fledged war with the nomadic Dassanach tribe of Ethiopia to access the Lake and the grazing land around it. “My parents were pastoral nomads, but I had to shift to fishing on the Lake for a living,” says Lolaramaya of Todoyang village, which is Kenya’s last village before the Ethiopian border. “Due to regular clashes with the Dassanach tribe, I am struggling to even do fishing,” adds Lolaramaya, while sitting in the courtyard of a defunct church with an AK-47 rifle and a leather pouch containing bullets. He says that for a routine fishing expedition to the Lake, which lasts for two days, he goes with at least eight other men, all armed and ready to fight the Dassanach tribe. So what turned two of the world’s oldest tribes into enemies? The region’s temperature has been rising—2oC to 3oC between 1967 and 2012, going by a 2012 Oxford University report—which has lead to unprecedented droughts and dwindling water resources. Add to that a series of developmental projects on the Omo River, which feeds 90 per cent of the water to the Lake. These reasons have not only left the desert region more arid, but also brought the two communities in close contact with each other for livelihood. Soon, this led to a battle for monopoly over land and water. Distrust has always existed between the two tribes due to their cultural differences. The Dassanach tribe believes that a boy has to show bravery and grit before he is considered a man. For this, the boy has to attack an enemy—usually the Turkana tribe—and steal his cattle. Experts, however, say these cultural clashes were never widespread. The conflicts began to intensify when the frequency and intensity of droughts started to increase in the 1970s. Regular droughts affected the tribe in two ways: widespread livestock losses and shrinking of the 100-sq km long grazing area along the Lake (See ‘Left out to dry’). The mortality rate of small livestock in the 1970s was close to 70 per cent, says a 2010 African Development Bank report. This forced thousands of Turkana families to move closer to the Lake and take up fishing, one of the primary livelihoods for the Dassanach tribe. Another fallout of frequent droughts has been the concentration of the tribe around the Lake because of international aid. The Oxford University report, Lake Turkana and the Lower Omo: Hydrological Impacts of Major Dams and Irrigation Developments, says humanitarian food aid since the 1970s “has exacerbated tensions through resultant in-migration attracted by the opportunity to take advantage of food aid”. In fact, the population in the region has increased from an estimated 0.86 million in 2009 to 1.26 million in 2015, suggest government reports. “Today, drought has become an annual feature in the region. 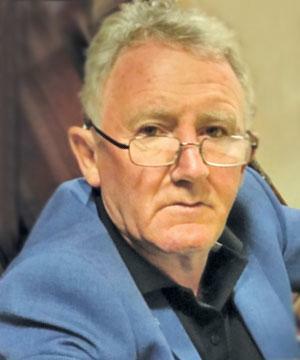 It used to be just once every four years earlier,” says Paul Obunde, planning and policy manager, National Drought Management Authority (NDMA), Kenya. An internal NDMA report, accessed by Down To Earth, shows the region faced droughts or received deficit rainfall in 13 of the last 16 years. Even the number of people affected by droughts is increasing every year. In 2017, 2.5 million people were affected in the region due to droughts, up from 1 million in 2013, as per the Ending Drought Emergencies in Kenya report, published by NDMA in September 2017. “We have a short rainy period in April-May and longer rainy period in November-December. But trends show that we have lesser rain year on year,” says Obunde. 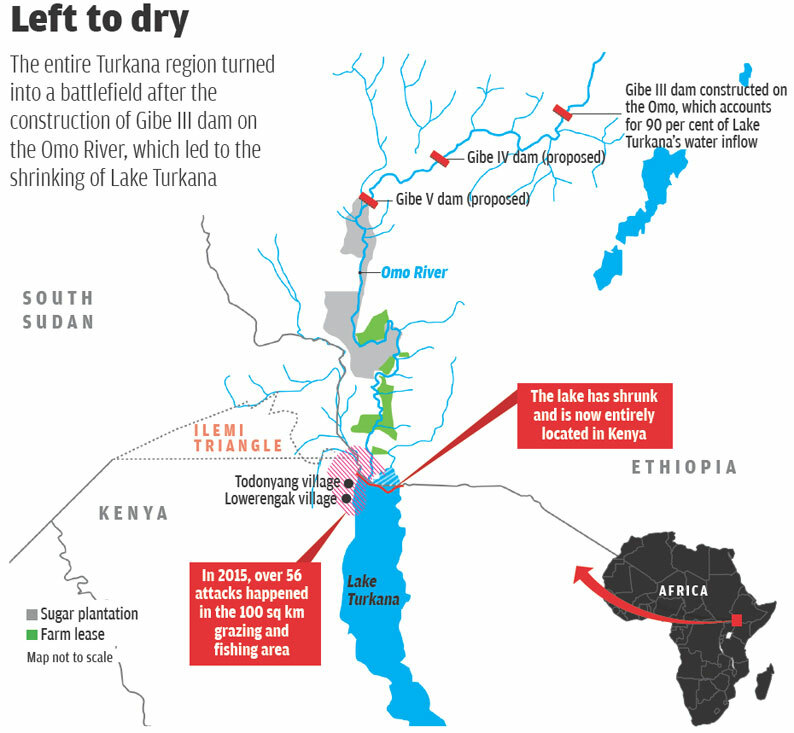 The impact of climate change can also be gauged from the fact that Lake Turkana is shrinking even when 10 others Rift Valley lakes are growing in size. The Rift Valley lakes were formed due to a shift in the tectonic plates millions of years ago. Experts say that till recently, all the 10 lakes would flood and go dry at the same time. “In August this year, while the Rift Valley lakes in central Kenya—Naivasha and Elmenteita—registered higher than normal water levels, Lake Turkana had lower than normal water levels,” says John Malala, a senior scientist with the government-run Kenya Marine Fisheries Research Institute in Turkana. With the pastoral economy no more viable, the dependency of the Turkana people on fishing increased manifolds. The region turned into a battlefield after the construction of the Gibe III dam on the Omo River, which lead to the shrinking of the Lake. “Its construction commenced (in 2006) without any prior environmental and social impact assessment, Kenyan stakeholders were not consulted,” says the Oxford University report. In early 2011, Ethiopia also started a large-scale irrigation project for water-intensive sugar-cane plantation in the Lower Omo. Today, the Lake, which till recently extended to Ethiopia, has shrunk to Kenya. Even its salinity has increased. “As a result, the Lake’s fish production has reduced,” says Malala. “Both tribes claim their rights over the wetland and the Lake. The shrinking of the Lake means the Dassanach tribe now enters Kenya for livelihood,” says Malala. He adds that tribes do not follow the political boundaries and rely on their cultural boundary, which changes with change in water source. In the absence of political will and resources, the Turkana tribe continues to live in uncertainty. In May 2011, the Dassanach tribe entered the Todoyang village and killed 65 people and injured hundreds. The incident created so much fear that over 1,200 people from the village fled overnight to Kalokal village, which is 100 km south of Todoyang. “In response, we have killed more than 100 Dassanach people,” says George Loiyanda, the 52-year-old chief of Todoyang. He admits that some of his tribe men, whom he refers to as warriors, have been killed in the revenge clashes. Today, Todoyang has only 23 families and a military check post. “The families that are left in the village today are either herders or shepherds, who need the grazing land,” says Todoyang priest Mathew Idewa. The families in Todoyang say guns and not the government are helping them survive in the area. “We always carry guns, not only to save the cattle, but also the grazing land from the Dassanach men,” says Lokkwasinyan, a 27-year-old herder in Todoyang. “They come in large numbers, attack our cattle and us, and use the land for grazing their cattle,” says Loinggawa, another pastoralist from the village. While the Kenyan government does not maintain a registry of the clashes, media reports suggest that in 2015, more than 75 people were killed and 25,000 cattle were stolen in 56 different attacks. Meanwhile, the government is making slow progress in the area. “We are facilitating cross-border peace dialogues where people from both communities are made to meet and find peaceful solutions,” says Selina Wanjiri, assistant secretary in the Ministry of Interior and Coordination of National Government and a nodal officer working with the Inter-Governmental Authority on Development, set up by the East African countries to bring stability in the region. She adds that in past meetings, communities have returned children, cattle and fishing nets that were stolen during raids. Experts say these small initiatives are unlikely to help, especially when the Ethiopian government is planning two more dams and an irrigation project on Omo River. “They will impact half a million additional people in the region,” says Ikal Angelei of Friends of Lake Turkana, a non-profit working on advocacy against dams and promoting livelihood of the Turkana people. The irrigation projects are being constructed for the proposed 175,000-hectares Kuraz sugar plantations and factories in Lower Omo that will be established on areas recently de-gazetted from the Tama wildlife sanctuary and the Mago and Omo national parks. “The government has even identified Indian and Malaysian companies for the plantations,” says Angelei. How can the crisis be resolved? The arms race in the region has to be checked by both governments. And at the same time, the eco-system in the region needs to be rejuvenated. “Till then, the communities will not believe in the administration,” says Paulson, a researcher at the Shalom Center for Conflict Resolution and Reconciliation, Kenya. The Turkana people say they are “fed up of the clashes”. They are quick to add that they do not see an end in sight. What are the reasons behind the conflicts between the Turkana and the Dassanach tribes on the Kenya-Ethiopia border? There are five specific causes. First is the issue of environmental resource, which has become a problem, not due to scarcity but mismanagement. Second is the issue of cultural variations between the two groups. The third is the issue of contested territory. Fourth is the lack of basic government institutions—such as courts, hospitals and schools—in both communities. Fifth is the proliferation of arms in both communities. A family in the region has on an average two AK-47 rifles. How are cultural differences triggering the conflicts? Cultural differences have a direct impact on the conflict. The Dassanach tribe believes that a boy has to show bravery and grit before he is considered a man. For this, the boy has to attack an enemy—usually the Turkana tribe—and steal his cattle. This culture of violence needs to be transformed. Instead, the growing population, along with mismanagement of resources, has led to greater violence in the area. What steps have the governments of the two countries taken to bring peace in the region? The countries are continually introducing programmes to bring peace. But they do not have sufficient institutional mechanism to control the conflict. I saw people carry guns openly, even in front of the Army. It looks as if there is no presence of the state institutions in the area? You cannot say the governments are not present. There needs to be a greater institutional presence in the area. What are the geopolitical reasons contributing to the conflict in the region? The conflict between Turkana and Dassanach tribes is part of a wider geopolitical crisis in the area. Besides Dassanach, the Turkana tribe is in conflict with four other tribes: Topas from south Sudan, Dodoth from Uganda, Phokat and Samburu from other counties of Kenya. At the heart of the conflicts is the disputed Ilemi Triangle which is spread across South Sudan, Kenya and Ethiopia. Governments in East Africa have recently set up the Inter-Governmental Authority on Development to manage conflict and bring peace in the region. What is your organisation doing in the area? We are currently engaged with 11 tribes in northern Kenya where we first identify the key underlying factors for their conflicts. Then we engage influential chiefs, religious leaders, youth leaders, women leaders in each community and train them to manage conflicts. We are also promoting inter-ethnic education, along with rehabilitation and reconstruction. Recently there was a report that there were huge reservoirs of water in the lake basin to last the country over 70 years. So far, there has been no effort to pursue the prospects of accessing this resource.